Blackinton BH1965-F Round Shield Badge - BH1965-F - 2" x 2 1/2"
Home > Blackinton > Police Badges > Fire Badges > BH1965-F Round Shield Badge - BH1965-F - 2" x 2 1/2"
BH1965-F Round Shield Badge - BH1965-F - 2" x 2 1/2"
This decorative badge from Blackinton is great for law enforcement and fire department use. The model measures 2" by 2 1/2" and features four panels for you to customize with your lettering with font color choices of black, red or blue. 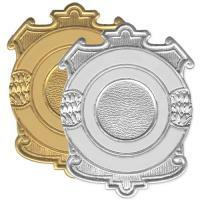 The BH1965-F is a round style shield badge and contains a 15/16" center space for seal. Like all Blackinton badges, it is proudly made right here in the United States. When ordering, please allow 4-6 weeks to receive your order. Measures 2" by 2 1/2"
©2002-2019 CopsPlus.com: Blackinton BH1965-F Round Shield Badge - BH1965-F - 2" x 2 1/2"